Leave a Comment / Gift Suggestions / By Kate I.
We’ve decided to help you and have made up a list where you can find how ‘Happy New Year!’ is said in the most popular languages. If you also want to send a gift basket for New Year to your nearest and dearest to another country you can visit our website http://www.giftbasketsoverseas.com/, where you can find plenty of holiday gift ideas. 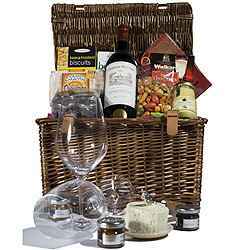 Make a good first impression with this classy gift basket. Christmas and New Year flowers are the symbols of gaiety, love, beauty, hope, and all the tenderest emotions in the human heart such as sharing, happiness, joy, kindness and virtues that make winter holidays more special than any other festival. Often used to decorate homes during holiday season as wreaths and Christmas centerpieces, people also exchange them as Christmas and New Year gifts in the form of bouquets and flower baskets. Flowers and greenery add interesting land festive look to the homes and tune everyone up with the spirit of winter holidays. 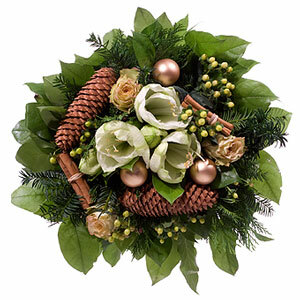 You can buy several beautifully prepared holiday floral arrangements from the online flower shop and gift them to the hosts of the Christmas and New Year parties you are attending this year and also send flowers to the family, friends, business associates and loved ones who are not with you to share the joys of the Christmas season or are out of town using a few simple clicks. 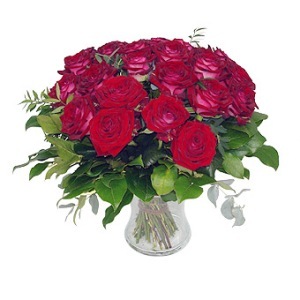 Though Christmas flowers encompass all the varieties of flowers including the tropical ones these days because of the global connectivity and quick communication and transportation facilities, still, Poinsettias and Christmas Roses continue to enjoy a special place in Christmas and New Year celebration because of the beautiful legends that attach them to this particular festival. Christmas Roses are English in their origin and are believed to bloom in the snow-covered mountains of Central Europe at the time, when the winter is at its prime, often during the Christmas season and thus, deserves to be known as the true Christmas blossom. People also call this white colored flower with pink tipped petals by the name of Snow Rose or Winter Rose as it blooms during the Winter season at the time when all the other greenery bows down under a thick layer of snow. Bright, flaming red, star-shaped Poinsettias are known as ‘Flower of the Holy Night’ or ‘Flame Leaf’ in the United States. One of the most popular flowers in Central America, it was brought here by Dr. Joel Poinsett, the first US ambassador to Mexico, over a hundred years ago. Still most of the supply of this famous beloved Christmas flower in American cities is said to come from California and the folklore attached to it comes from Mexico. Like Christmas Rose, this flower also represents the deep love for Christ and great devotion of a pure innocent human being to baby Jesus. Nothing says Happy Day like a basket overflowing with fragrant, freshly picked roses and a big, stuffed animal toy. Thank you so much for your personal help in this matter. I am very impressed with your level of service and will most definitely use your company again. To make your lives easier, we’ve decided to make up a list where you can find how ‘Merry Christmas’ is said in the most popular languages. If you also want to send a gift basket for Christmas to your nearest and dearest to another country you can visit our website http://www.giftbasketsoverseas.com/, where you can find plenty of holiday gift ideas. 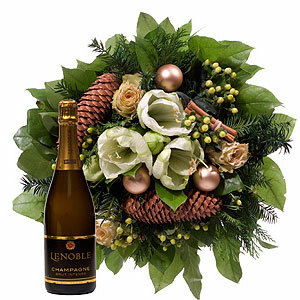 A Christmas flower arrangement and a bottle of champagne perfectly suit for both corporate and personal gift. Christmas in Japan is quite different from the Christmas celebrated in most countries. Only 1% of the Japanese population is estimated to be Christian, but in spite of this, the Japanese are great lovers of festivals and celebrations, including Christmas. December 25th is not a national holiday, so, the main celebration revolves around Christmas eve. Christmas is mostly a commercial event in Japan. Many people don’t know exactly what the origin of Christmas is. Therefore, the Japanese have adopted many Western customs related to observing Christmas. Lots of people decorate Christmas trees at home and hold parties around this holiday. Japanese people tend to find things of interest from abroad and transform them into something that is uniquely Japanese. It’s a Japanese way to celebrate Christmas Eve by eating Christmas cakes, which the father of the family purchases on his way home from work. Stores all over carry versions of this Christmas cake and drop the price of it drastically on December 25th in order to sell everything out by the 26th. Christmas Eve has also become a night for lovers to go out and spend a romantic time together at fancy restaurants or hotels. It isn’t easy to make reservations for such restaurants and hotels at the last minute on this day. For the more elderly couples, many hotels host dinner shows featuring major singers, actors, and actresses. Tickets to these shows, due to the season, are very pricy. 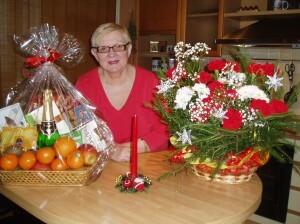 Christmas presents are exchanged between people with romantic commitments as well as close friends. The romantic gifts tend to be ‘cute’ and often include Teddy Bears, flowers, sweets baskets, scarves, rings and other jewelry. Christmas cards are also given to close friends. Besides exchanging Christmas gifts, there is a custom of sending oseibo (the end of the year gift), corporate gifts from one company to another. For Japanese people, Christmas is an enjoyable day in the year, but New Year is much more important for them.